I had a variety of concerns and exercises about my soul from my childhood; but had two more remarkable seasons of awakening, before I met with that change by which I was brought to those new dispositions, and that new sense of things, that I have since had. The first time was when I was a boy, some years before I went to college, at a time of remarkable awakening in my father’s congregation. I was then very much affected for many months, and concerned about the things of religion, and my soul’s salvation; and was abundant in religious duties. I used to pray five times a day in secret, and to spend much time in religious conversation with other boys; and used to meet with them to pray together. I experienced I know not what kind of delight in religion. My mind was much engaged in it, and had much self-righteous pleasure; and it was my delight to abound in religious duties. I, with some of my schoolmates, joined together and built a booth in a swamp, in a very retired spot, for a place of prayer. And besides, I had particular secret places of my own in the woods, where I used to retire by myself; and was from time to time much affected. My affections seemed to be lively and easily moved, and I seemed to be in my element when engaged in religious duties. And I am ready to think, many are deceived with such affections, and such a kind of delight as I then had in religion, and mistake it for grace. But in process of time, my convictions and affections wore off; and I entirely lost all those affections and delights, and left off secret prayer, at least as to any constant performance of it; and returned like a dog to his vomit, and went on in the ways of sin. Indeed, I was at times very uneasy, especially towards the latter part of my time at college; when it pleased God to seize me with a pleurisy, in which he brought me nigh to the grave, and shook me over the pit of hell. And yet, it was not long after my recovery, before I fell again into my old ways of sin. But God would not suffer me to go on with any quietness; I had great and violent inward struggles, till after many conflicts with wicked inclinations, repeated resolutions, and bonds that I laid myself under by a kind of vows to God, I was brought wholly to break off all former wicked ways, and all ways of known outward sin; and to apply myself to seek salvation, and practice many religious duties; but without that kind of affection and delight which I had formerly experienced. My concern now wrought more by inward struggles and conflicts, and self-reflections. I made seeking my salvation the main business of my life. But yet, it seems to me, I sought after a miserable manner, which has made me sometimes since to question, whether ever it issued in that which was saving; being ready to doubt whether such miserable seeking ever succeeded. I was indeed brought to seek salvation in a manner that I never was before; I felt a spirit to part with all things in the world, for an interest in Christ. My concern continued and prevailed, with many exercising thoughts and inward struggles; but yet it never seemed to be proper to express that concern by the name of terror. From my childhood up, my mind had been full of objections against the doctrine of God’s sovereignty, in choosing whom he would to eternal life, and rejecting whom he pleased; leaving them eternally to perish, and be everlastingly tormented in hell. It used to appear like a horrible doctrine to me. But I remember the time very well, when I seemed to be convinced, and fully satisfied, as to this sovereignty of God, and his justice in thus eternally disposing of men, according to his sovereign pleasure. But I never could give an account how, or by what means, I was thus convinced, not in the least imagining at the time, nor a long time after, that there was any extraordinary influence of God’s Spirit in it; but only that now I saw further, and my reason apprehended the justice and reasonableness of it. However, my mind rested in it; and it put an end to all those cavils and objections. And there has been a wonderful alteration in my mind, with respect to the doctrine of God’s sovereignty, from that day to this; so that I scarce ever have found so much as the rising of an objection against it, in the most absolute sense, in God showing mercy to whom he will show mercy, and hardening whom he will. God’s absolute sovereignty and justice, with respect to salvation and damnation, is what my mind seems to rest assured of, as much as of any thing that I see with my eyes; at least it is so at times. But I have often, since that first conviction, had quite another kind of sense of God’s sovereignty that I had then. I have often since had not only a conviction, but a delightful conviction. The doctrine has very often appeared exceeding pleasant, bright, and sweet. Absolute sovereignty is what I love to ascribe to God. But my first conviction was not so. The first instance that I remember of that sort of inward, sweet delight in God and divine things, that I have lived much in since, was on reading those words, 1 Tim. 1:17, “Now unto the King, eternal, immortal, invisible, the only wise God, be honor and glory forever and ever, Amen.” As I read the words, there came into my soul, and was as it were diffused through it, a sense of the glory of the Divine Being; a new sense, quite different from any thing I ever experienced before. Never any words of Scripture seemed to me as these words did. I thought with myself, how excellent a Being that was, and how happy I should be, if I might enjoy that God, and be rapt up to him in heaven; and be as it were swallowed up in him forever! I kept saying, and as it were singing, over these words of Scripture to myself; and went to pray to God that I might enjoy him; and prayed in a manner quite different from what I used to do, with a new sort of affection. But it never came into my thought, that there was any thing spiritual, or of a saving nature, in this. From about that time, I began to have a new kind of apprehensions and ideas of Christ, and the work of redemption, and the glorious way of salvation by him. An inward, sweet sense of these things, at times, came into my heart; and my soul was led away in pleasant views and contemplations of them. And my mind was greatly encouraged to spend my time in reading and meditating on Christ, on the beauty and excellency of his person, and the lovely way of salvation by free grace in him. I found no books so delightful to me, as those that treated of these subjects. Those words, Song. 2:1, used to be abundantly with me, “I am the Rose of Sharon, and the Lily of the valleys.” The words seemed to me sweetly to represent the loveliness and beauty of Jesus Christ. The whole book of Canticles used to be pleasant to me, and I used to be much in reading it, about that time; and found, from time to time, an inward sweetness, that would carry me away in my contemplations. This I know not how to express otherwise, than by a calm, sweet abstraction of soul from all the concerns of this world; and sometimes a kind of vision, or fixed ideas and imaginations, of being alone in the mountains, or some solitary wilderness, far from all mankind, sweetly conversing with Christ, and rapt and swallowed up in God. The sense I had of divine things, would often of a sudden kindle up, as it were, a sweet burning in my heart; an ardor of soul that I know not how to express. Not long after I first began to experience these things, I gave an account to my father of some things that had passed in my mind. I was pretty much affected by the discourse we had together; and when the discourse was ended, I walked abroad alone, in a solitary place in my father’s pasture, for contemplation. And as I was walking there, and looking up on the sky and clouds, there came into my mind so sweet a sense of the glorious majesty and grace of God, that I know not how to express. — I seemed to see them both in a sweet conjunction; majesty and meekness joined together: it was a sweet and gentle, and holy majesty; and also a majestic meekness; an awful sweetness; a high, and great, and holy gentleness. After this my sense of divine things gradually increased, and became more and more lively, and had more of that inward sweetness. The appearance of every thing was altered; there seemed to be, as it were, a calm, sweet cast, or appearance of divine glory, in almost every thing. God’s excellency, his wisdom, his purity and love, seemed to appear in every thing; in the sun, and moon, and stars; in the clouds and blue sky; in the grass, flowers, trees; in the water, and all nature; which used greatly to fix my mind. I often used to sit and view the moon for a long time; and in the day, spent much time in viewing the clouds and sky, to behold the sweet glory of God in these things; in the mean time, singing forth, with a low voice, my contemplations of the Creator and Redeemer. And scarce any thing, among all the works of nature, was so sweet to me as thunder and lightning; formerly nothing had been so terrible to me. Before, I used to be uncommonly terrified with thunder, and to be struck with terror when I saw a thunderstorm rising; but now, on the contrary, it rejoiced me. I felt God, if I may so to speak, at the first appearance of a thunderstorm; and used to take the opportunity, at such times, to fix myself in order to view the clouds and see the lightnings play, and hear the majestic and awful voice of God’s thunder, which oftentimes was exceedingly entertaining, leading me to sweet contemplations of my great and glorious God. While thus engaged, it always seemed natural to me to sing or chant forth my meditations; or, to speak my thoughts in soliloquies with a singing voice. I felt then great satisfaction as to my good estate; but that did not content me. I had vehement longings of soul after God and Christ, and after more holiness, wherewith my heart seemed to be full, and ready to break; which often brought to my mind the words of the psalmist, Psa. 119:28, “My soul breaketh for the longing it hath.” I often felt a mourning and lamenting in my heart, that I had not turned to God sooner, that I might have had more time to grow in grace. My mind was greatly fixed on divine things; almost perpetually in the contemplation of them. I spent most of my time in thinking of divine things, year after year; often walking alone in the woods, and solitary places, for meditation, soliloquy, and prayer, and converse with God; and it was always my manner, at such times, to sing forth my contemplations. I was almost constantly in ejaculatory prayer, wherever I was. Prayer seemed to be natural to me, as the breath by which the inward burnings of my heart had vent. The delights which I now felt in the things of religion, were of an exceeding different kind from those before mentioned, that I had when a boy; and what then I had no more notion of, than one born blind has of pleasant and beautiful colors. They were of a more inward, pure, soul-animating, and refreshing nature. Those former delights never reached the heart; and did not arise from any sight of the divine excellency of the things of God; or any taste of the soul-satisfying, and life-giving good there is in them. My sense of divine things seemed gradually to increase, till I went to preach at New York, which was about a year and a half after they began: and while I was there I felt them very sensibly, in a much higher degree than I had done before. My longings after God and holiness were much increased. Pure and humble, holy and heavenly, Christianity appeared exceedingly amiable to me. I felt a burning desire to be, in every thing, a complete Christian; and conformed to the blessed image of Christ; and that I might live, in all things, according to the pure, sweet, and blessed rules of the gospel. I had an eager thirsting after progress in these things; which put me upon pursuing and pressing after them. It was my continual strife day and night, and constant inquiry, how I should be more holy, and live more holily, and more becoming a child of God, and a disciple of Christ. I now sought an increase of grace and holiness, and a holy life, with much more earnestness than ever I sought grace before I had it. I used to be continually examining myself, and studying and contriving for likely ways and means how I should live holily, with far greater diligence and earnestness than ever I pursued any thing in my life; but yet with too great a dependence on my own strength; which afterwards proved a great damage to me. My experience had not then taught me, as it has done since, my extreme feebleness and impotence, every manner of way; and the bottomless depths of secret corruption and deceit there was in my heart. However, I went on with my eager pursuit after more holiness, and conformity to Christ. The heaven I desired was a heaven of holiness; to be with God, and to spend my eternity in divine love, and holy communion with Christ. My mind was very much taken up with contemplations on heaven, and the enjoyments there; and living there in perfect holiness, humility, and love; and it used at that time to appear a great part of the happiness of heaven, that there the saints could express their love to Christ. It appeared to me a great clog and burden, that what I felt within, I could not express as I desired. The inward ardor of my soul seemed to be hindered and pent up, and could not freely flame out as it would. I used often to think, how in heaven this principle should freely and fully vent and express itself. Heaven appeared exceedingly delightful, as a world of love; and that all happiness consisted in living in pure, humble, heavenly, divine love. I remember the thoughts I used then to have of holiness; and said sometimes to myself, “I do certainly know that I love holiness, such as the gospel prescribes.” It appeared to me that there was nothing in it but what was ravishingly lovely; the highest beauty and amiableness — a divine beauty; far purer than any thing here upon earth; and that every thing else was like mire and defilement in comparison of it. Holiness, as I then wrote down some of my contemplations on it, appeared to me to be of a sweet, pleasant, charming, serene, calm nature; which brought an inexpressible purity, brightness, peacefulness and ravishment to the soul. In other words, that it made the soul like a field or garden of God, with all manner of pleasant flowers; enjoying a sweet calm, and the gentle vivifying beams of the sun. The soul of a true Christian, as I then wrote my meditations, appeared like such a little white flower as we see in the spring of the year; low and humble on the ground, opening its bosom to receive the pleasant beams of the sun’s glory; rejoicing, as it were, in a calm rapture; diffusing around a sweet fragrancy; standing peacefully and lovingly, in the midst of other flowers round about; all in like manner opening their bosoms, to drink in the light of the sun. There was no part of creature holiness that I had so great a sense of its loveliness, as humility, brokenness of heart, and poverty of spirit; and there was nothing that I so earnestly longed for. My heart panted after this — to lie low before God, as in the dust; that I might be nothing, and that God might be all, that I might become as a little child. While at New York, I was sometimes much affected with reflections on my past life, considering how late it was before I began to be truly religious; and how wickedly I had lived till then: and once so as to weep abundantly, and for a considerable time together. On January 12, 1723, I made a solemn dedication of myself to God, and wrote it down; giving up myself, and all I had, to God; to be for the future in no respect my own; to act as one that had no right to himself, in any respect. And solemnly vowed to take God for my whole portion and felicity; looking on nothing else as any part of my happiness, nor acting as it were; and his law for the constant rule of my obedience; engaging to fight with all my might against the world, the flesh, and the devil, to the end of my life. But I have reason to be infinitely humbled, when I consider how much I have failed of answering my obligation. I had then abundance of sweet religious conversation in the family where I lived, with Mr. John Smith and his pious mother. My heart was knit in affection to those in whom were appearances of true piety; and I could bear the thoughts of no other companions but such as were holy, and the disciples of the blessed Jesus. I had great longings for the advancement of Christ’s kingdom in the world; and my secret prayer used to be, in great part, taken up in praying for it. If I heard the least hint of any thing that happened in any part of the world, that appeared, in some respect or other, to have a favorable aspect on the interests of Christ’s kingdom, my soul eagerly catched at it, and it would much animate and refresh me. I used to be eager to read public newsletters, mainly for that end; to see if I could not find some news favorable to the interest of religion in the world. I very frequently used to retire into a solitary place, on the banks of Hudson’s river, at some distance from the city, for contemplation on divine things and secret converse with God; and had many sweet hours there. Sometimes Mr. Smith and I walked there together, to converse on the things of God; and our conversation used to turn much on the advancement of Christ’s kingdom in the world, and the glorious things that God would accomplish for his church in the latter days. I had then, and at other times, the greatest delight in the Holy Scriptures of any book whatsoever. Oftentimes in reading it, every word seemed to touch my heart. I felt a harmony between something in my heart, and those sweet and powerful words. I seemed often to see so much light exhibited by every sentence, and such a refreshing food communicated, that I could not get along in reading; often dwelling long on one sentence, to see the wonders contained in it; and yet almost every sentence seemed to be full of wonders. I came away from New York in the month of April, 1723, and had a most bitter parting with Madam Smith and her son. My heart seemed to sink within me at leaving the family and city, where I had enjoyed so many sweet and pleasant days. I went from New York to Wethersfield, by water, and as I sailed away, I kept sight of the city as long as I could. However, that night, after this sorrowful parting, I was greatly comforted in God at Westchester, where we went ashore to lodge; and had a pleasant time of it all the voyage to Saybrook. It was sweet to me to think of meeting dear Christians in heaven, where we should never part more. At Saybrook we went ashore to lodge on Saturday, and there kept the sabbath; where I had a sweet and refreshing season walking alone in the fields. After I came home to Windsor, I remained much in a like frame of mind as when at New York; only sometimes I felt my heart ready to sink with the thoughts of my friends at New York. My support was in contemplations on the heavenly state; as I find in my diary of May 1, 1723. It was a comfort to think of that state, where there is fullness of joy; where reigns heavenly calm, and delightful love, without alloy; where there are continually the dearest expressions of love; where is the enjoyment of the persons loved, without ever parting; where these persons who appear so lovely in this world, will really be inexpressibly more lovely and full of love to us. And how sweetly will the mutual lovers join together, to sing the praises of God and the Lamb! How will it fill us with joy to think that this enjoyment, these sweet exercises, will never cease but will last to all eternity! I continued much in the same frame, in the general, as when at New York, till I went to New Haven as tutor of the college; particularly once at Bolton, on a journey from Boston, while walking out alone in the fields. After I went to New Haven, I sunk in religion, my mind being diverted from my eager pursuits after holiness, by some affairs that greatly perplexed and distracted my thoughts. In September, 1725, I was taken ill at New Haven, and while endeavoring to go home to Windsor, was so ill at the North Village, that I could go no further; where I lay sick for about a quarter of a year. In this sickness, God was pleased to visit me again with the sweet influences of his Spirit. My mind was greatly engaged there on divine and pleasant contemplations, and longings of soul. I observed that those who watched with me, would often be looking out wishfully for the morning; which brought to my mind those words of the psalmist, and which my soul with delight made its own language, “My soul waiteth for the Lord, more than they that watch for the morning; I say, more than they that watch for the morning”; and when the light of day came in at the window, it refreshed my soul from one morning to another. It seemed to be some image of the light of God’s glory. I remember, about that time, I used greatly to long for the conversion of some that I was concerned with; I could gladly honor them, and with delight be a servant to them, and lie at their feet, if they were but truly holy. But some time after this, I was again greatly diverted with some temporal concerns, that exceedingly took up my thoughts, greatly to the wounding of my soul; and went on through various exercises, that it would be tedious to relate, which gave me much more experience of my own heart, than ever I had before. Since I came to Northampton, I have often had sweet complacency in God, in views of his glorious perfections and of the excellency of Jesus Christ. God has appeared to me a glorious and lovely Being, chiefly on the account of his holiness. The holiness of God has always appeared to me the most lovely of all his attributes. The doctrines of God’s absolute sovereignty, and free grace, in showing mercy to whom he would show mercy; and man’s absolute dependence on the operations of God’s Holy Spirit, have very often appeared to me as sweet and glorious doctrines. These doctrines have been much my delight. God’s sovereignty has ever appeared to me a great part of his glory. It has often been my delight to approach God, and adore him as a sovereign God, and ask sovereign mercy of him. I have loved the doctrines of the gospel; they have been to my soul like green pastures. The gospel has seemed to me the richest treasure; the treasure that I have most desired, and longed that it might dwell richly in me. The way of salvation by Christ has appeared, in a general way, glorious and excellent, most pleasant and most beautiful. It has often seemed to me, that it would, in a great measure, spoil heaven, to receive it in any other way. That text has often been affecting and delightful to me, Isa. 32:2, “A man shall be a hiding place from the wind, and a covert from the tempest,” etc. It has often appeared to me delightful, to be united to Christ; to have him for my Head, and to be a member of his body; also to have Christ for my Teacher and Prophet. I very often think with sweetness, and longings, and pantings of soul, of being a little child, taking hold of Christ, to be led by him through the wilderness of this world. That text, Mat. 18:3, has often been sweet to me, “Except ye be converted and become as little children,” etc. I love to think of coming to Christ, to receive salvation of him, poor in spirit, and quite empty of self, humbly exalting him alone; cut off entirely from my own root, in order to grow into, and out of Christ; to have God in Christ to be all in all; and to live by faith on the Son of God, a life of humble, unfeigned confidence in him. That Scripture has often been sweet to me, Psa. 115:1, “Not unto us, O Lord, not unto us, but unto thy name give glory, for thy mercy, and for thy truth’s sake.” And those words of Christ, Luke 10:21, “In that hour Jesus rejoiced in spirit, and said, I thank thee, O Father, Lord of heaven and earth, that thou hast hid these things from the wise and prudent, and hast revealed them unto babes: even so, Father, for so it seemed good in thy sight.” That sovereignty of God which Christ rejoiced in, seemed to me worthy of such joy; and that rejoicing seemed to show the excellency of Christ, and of what spirit he was. Sometimes, only mentioning a single word caused my heart to burn within me; or only seeing the name of Christ, or the name of some attribute of God. And God has appeared glorious to me, on account of the Trinity. It has made me have exalting thoughts of God, that he subsists in three persons; Father, Son, and Holy Ghost. The sweetest joys and delights I have experienced, have not been those that have arisen from a hope of my own good estate; but in a direct view of the glorious things of the gospel. When I enjoy this sweetness, it seems to carry me above the thoughts of my own estate; it seems, at such times, a loss that I cannot bear, to take off my eye from the glorious, pleasant object I behold without me, to turn my eye in upon myself, and my own good estate. My heart has been much on the advancement of Christ’s kingdom in the world. The histories of the past advancement of Christ’s kingdom have been sweet to me. When I have read histories of past ages, the pleasantest thing, in all my reading, has been to read of the kingdom of Christ being promoted. And when I have expected, in my reading, to come to any such thing, I have rejoiced in the prospect all the way as I read. And my mind has been much entertained and delighted with the Scripture promises and prophecies, which relate to the future glorious advancement of Christ’s kingdom upon earth. I have sometimes had a sense of the excellent fullness of Christ, and his meetness and suitableness as a Savior; whereby he has appeared to me, far above all, the chief of ten thousands. His blood and atonement have appeared sweet, and his righteousness sweet; which was always accompanied with ardency of spirit; and inward strugglings and breathings, and groanings that cannot be uttered, to be emptied of myself, and swallowed up in Christ. Once, as I rode out into the woods for my health, in 1737, having alighted from my horse in a retired place, as my manner commonly has been, to walk for divine contemplation and prayer, I had a view that for me was extraordinary, of the glory of the Son of God, as Mediator between God and man, and his wonderful, great, full, pure and sweet grace and love, and meek and gentle condescension. This grace that appeared so calm and sweet, appeared also great above the heavens. The person of Christ appeared ineffably excellent, with an excellency great enough to swallow up all thought and conception — which continued, as near as I can judge, about an hour; which kept me the greater part of the time in a flood of tears, and weeping aloud. I felt an ardency of soul to be, what I know not otherwise how to express, emptied and annihilated; to lie in the dust, and to be full of Christ alone; to love him with a holy and pure love; to trust in him; to live upon him; to serve and follow him; and to be perfectly sanctified and made pure, with a divine and heavenly purity. I have several other times had views very much of the same nature, and which have had the same effects. I have many times had a sense of the glory of the Third Person in the Trinity, and his office of Sanctifier; in his holy operations, communicating divine light and life to the soul. God, in the communications of his Holy Spirit, has appeared as an infinite fountain of divine glory and sweetness; being full and sufficient to fill and satisfy the soul; pouring forth itself in sweet communications; like the sun in its glory, sweetly and pleasantly diffusing light and life. And I have sometimes had an affecting sense of the excellency of the Word of God, as the word of life; as the light of life; a sweet, excellent, life-giving, word; accompanied with a thirsting after that word, that it might dwell richly in my heart. Often, since I lived in this town, I have had very affecting views of my own sinfulness and vileness; very frequently to such a degree as to hold me in a kind of loud weeping, sometimes for a considerable time together; so that I have often been forced to shut myself up. I have had a vastly greater sense of my own wickedness, and the badness of my heart, than ever I had before my conversion. It has often appeared to me, that if God should mark iniquity against me, I should appear the very worst of all mankind; of all that have been since the beginning of the world to this time; and that I should have by far the lowest place in the world to this time; and that I should have by far the lowest place in hell. When others, that have come to talk with me about their soul concerns, have expressed the sense they have had of their own wickedness by saying, that it seemed to them, that they were as bad as the devil himself; I thought their expressions seemed exceeding faint and feeble, to represent my wickedness. My wickedness, as I am in myself, has long appeared to me perfectly ineffable, and swallowing up all thought and imagination; like an infinite deluge, or mountains over my head. I know not how to express better what my sins appear to me to be, than by heaping infinite upon infinite, and multiplying infinite by infinite. Very often, for these many years, these expressions are in my mind and in my mouth, “Infinite upon infinite — Infinite upon infinite!” When I look into my heart, and take a view of my wickedness, it looks like an abyss, infinitely deeper than hell. And it appears to me, that were it not for free grace, exalted and raised up to the infinite height of all the fullness and glory of the great Jehovah, and the arm of his power and grace stretched forth in all the majesty of his power, and in all the glory of his sovereignty, I should appear sunk down in my sins below hell itself; far beyond the sight of every thing, but the eye of sovereign grace, that can pierce even down to such a depth. And yet, it seems to me that my conviction of sin is exceeding small and faint; it is enough to amaze me, that I have very little sense of my sinfulness. I know certainly, that I have very little sense of my sinfulness. When I have had turns of weeping for my sins, I thought I knew at the time that my repentance was nothing to my sin. I have greatly longed of late for a broken heart, and to lie low before God; and when I ask for humility, I cannot bear the thoughts of being no more humble than other Christians. It seems to me, that though their degrees of humility may be suitable for them, yet it would be a vile self-exaltation in me, not to be the lowest in humility of all mankind. Others speak of their longing to be “humbled in the dust”; that may be a proper expression for them, but I always think of myself, that I ought, and it is an expression that has long been natural for me to use in prayer, “to lie infinitely low before God.” And it is affecting to think, how ignorant I was, when a young Christian, of the bottomless, infinite depths of wickedness, pride, hypocrisy and deceit, left in my heart. I have a much greater sense of my universal, exceeding dependence on God’s grace and strength, and mere good pleasure, of late, than I used formerly to have; and have experienced more of an abhorrence of my own righteousness. The very thought of any joy arising in me, on any consideration of my own amiableness, performances, or experiences, or any goodness of heart or life, is nauseous and detestable to me. And yet, I am greatly afflicted with a proud and self-righteous spirit, much more sensibly than I used to be formerly. I see that serpent rising and putting, forth its head continually, every where, all around me. Though it seems to me, that in some respects, I was a far better Christian, for two or three years after my first conversion, than I am now; and lived in a more constant delight and pleasure; yet of late years, I have had a more full and constant sense of the absolute sovereignty of God, and a delight in that sovereignty; and have had more of a sense of the glory of Christ, as a Mediator revealed in the gospel. On one Saturday night, in particular, I bad such a discovery of the excellency of the gospel above all other doctrines, that I could not but say to myself, “This is my chosen light, my chosen doctrine;” and of Christ, “This is my chosen Prophet.” It appeared sweet, beyond all expression to follow Christ, and to be taught, and enlightened, and instructed by him; to learn of him, and live to him. Another Saturday night (Jan. 1739) I had such a sense, how sweet and blessed a thing it was to walk in the way of duty; to do that which was right and meet to be done, and agreeable to the holy mind of God; that it caused me to break forth into a kind of loud weeping, which held me some time, so that I was forced to shut myself up, and fasten the doors. I could not but, as it were, cry out, “How happy are they who do that which is right in the sight of God! They are blessed indeed, they are the happy ones!” I had, at the same time, a very affecting sense, how meet and suitable it was that God should govern the world, and order all things according to his own pleasure; and I rejoiced in it, that God reigned, and that his will was done. 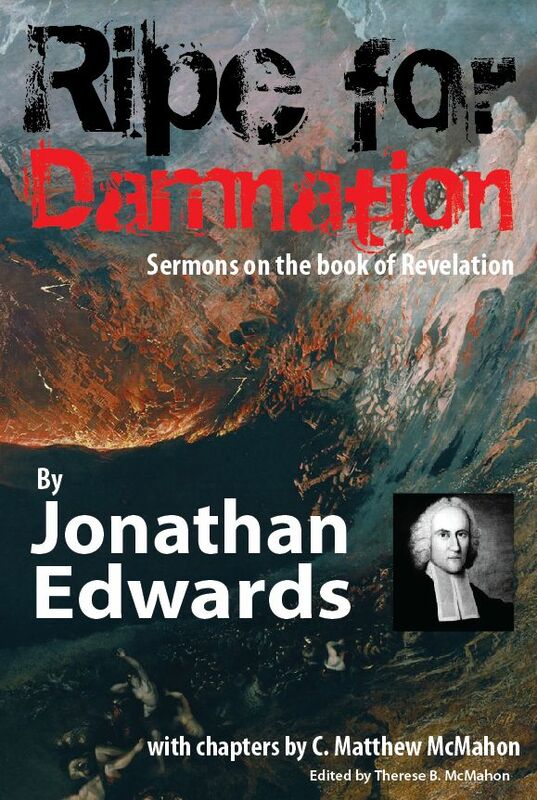 Ripe for Damnation: Sermons on the Book of Revelation – by Jonathan Edwards (1703–1758). Are you hungry for more of Edwards’ sermons? On the book of Revelation? These new works are not found anywhere on A Puritan’s Mind, and there are new ones not found in his large 2 volume works. 4 deal with the plight of the wicked, and 2 deal with the bliss of saints in heaven. 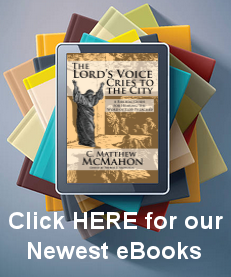 These sermons are powerful, practical, and biblical, glorifying the Lord Jesus Christ, and contain 2 never before published sermons. Justification by Faith Alone – by Jonathan Edwards (1703–1758). 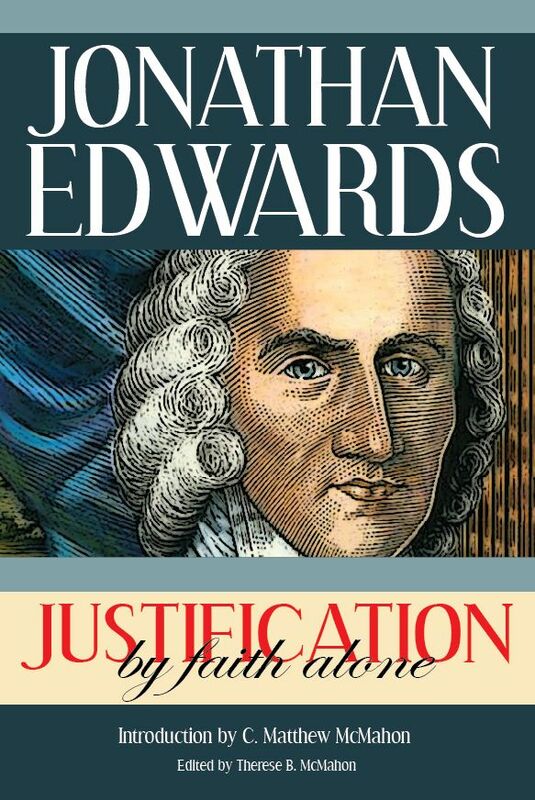 In this classic work, Edwards covers the intricacies of how believers are made righteous only through Christ’s merits, and that this justifying righteousness is equally imputed to all elect believers. This is accomplished by the condition of faith as an instrument.